Jan 14, 2014; Dallas, TX, USA; Dallas Stars left wing Ryan Garbutt (16) celebrates center Cody Eakin (not pictured) goal against Edmonton Oilers goalie Ilya Bryzgalov (not pictured) during the second period at the American Airlines Center. Garbutt also scores a goal in the first period. To their credit, the Dallas Stars were bound and determined that their six-game losing streak, equaling the club’s longest in regulation since the 1993 move to Dallas, would come to an end Tuesday night against the Edmonton Oilers at American Airlines Center. And that’s exactly what transpired. The Stars took their first lead 14 seconds in when Erik Cole put the home side ahead early. And aside from the game being tied at 1-1 for a bit in the opening period, this game belonged to the home side. Sure, they didn’t score at all in the third until Trevor Daley added an empty-netter with 39 seconds remaining, but that didn’t really matter. Dallas was now off the skids thanks to a 4-2 win over the Oilers and no one was happier than Stars captain Jamie Benn. "You have no idea," was Benn’s response when asked how relieved he was to see the Stars finally win for the first time in 2014. Daley echoed his sentiments but added his own twist to the end of the streak. "I don’t think I’ve ever been part of a third period that I wanted to end so fast," he said. Besides a favorable outcome, there were other positives to come out of the win. 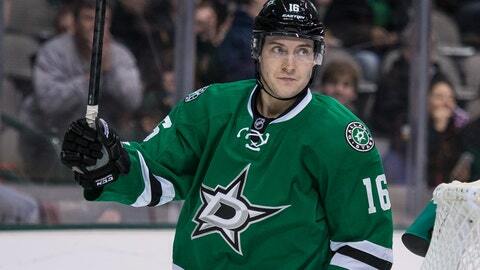 One of the biggest was the three-point night from Ryan Garbutt, who had a goal and two assists. Garbutt, a true grinder who by definition is someone who works tirelessly on the ice and does all those little things it takes to win like dig pucks out of the corner, block shots and put himself out there for the team. And as Stars first-year head coach Lindy Ruff said postgame, it was good to see No. 16 rewarded for those often unsung efforts, which never go unnoticed by Ruff or the rest of the Stars coaching staff or by Garbutt’s teammates for that matter. "I thought Ryan’s play was excellent, he made some great plays. He hit a crossbar in the second period and he’s really skating well. Obviously he’s a difference maker, he’s an energy guy for us and it was nice to see him get rewarded because that line has worked hard, he’s worked real hard," Ruff said. "I’m pushing him for a better level of discipline inside his game and he’s getting rewarded for it. I had a conversation with him again before the game tonight about some of the plays in the previous game that I didn’t like. I said ‘I just want you to improve in a couple of those areas’ and tonight I thought might have been one of his best games." One additional positive to come from the win over Edmonton was the Stars converting on their lone power play opportunity of the night, a great development for what has been the worst home PP in the League this season. "That was good to see. We worked both units real hard," Ruff said. "Again tomorrow we’re going to keep working at it. I thought Tyler (Seguin) made a great play and [Jamie Benn] a great shot. It was good to see it go in. We’ve had that same look a few times and haven’t scored. Puck movement was good and hopefully that leads to better times ahead for the power play." Dallas concludes its three-game homestand on Thursday against the Boston Bruins, a game that will be the homecoming for a pair of former Stars in Loui Eriksson and Reilly Smith.